Nothing quite compares with the experience of hearing and seeing Kenny Garrett 's storm-force alto saxophone playing live for the first time. It’s one thing to hear the records. And there are many to choose from, including affiliations with titans such as John McLaughlin, Chick Corea and Pharoah Sanders (above). But seeing one of the last major graduates of the Miles Davis bands, rocking back and forth on the stage of Ronnie Scott's in full improvisational fury is something else. With near apocalyptic sounding saxophone shrieks and wild cheers from the audience, it's a surprise that the roof stays on. The quartet summons up a superb visual and audio spectacle, and in the course of the night finds a vast range of colours and moods. Nathan Webb’s James Brown-esque drum grooves, Johnny Mercier’s single chord gospel clicks from his Hammond organ and Kona Khasu ’s solid bass riffs were all contagious. Garrett was last to join the mix with his trademark cutting tone and rhythmic precision. Single note stabs built to an impressive wall of sound with Garrett soon scaling the full range of his saxophone. As Mercier’s flat palms hit either register of the organ keyboard, Garrett tapped another effects pedal, and took the quartet down a fiery path of musical interplay. Kenny Garrett’s clip on saxophone mic gave him freedom to turn to Webb to share rhythmic ideas, feed from the groups energy, or stand over a keyboard and accompany Mercier’s organ solos. The image of Kenny Garrett lit centre stage facing his band, staring up at the sky (or a low ceiling in the case) with organ drones and persistent drum hits in a mesmerising trance is certainly a striking one and verges on almost biblical imagery. He stayed motionless for a tense few seconds, then strolled up to the microphone and dismissed the whole ordeal with a simple “Thank You” and a smile. It was impossible to predict this quartet’s next move, and I more than once caught myself wondering if the Garrett MC-ing to an adoring crowd playing his sing-along hit “Happy People” was the same one that was crying into the microphone moments ago. As another long and intense musical journey came to a close, the band cooled things down with “Asian Melody”, an intimate and soulful lullaby between Garrett on soprano sax and Johnny Mercier, who had deserted his whirling organ for tender piano chords. The audience was silently transfixed by the lilting melody. After a turbulent evening, many people were clearly happy to hear the familiarity of a reprise of the crowd pleaser “Happy People.” A great evening. "Can I put a counter argument to this review? 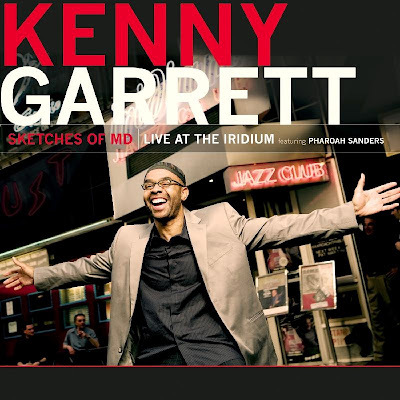 As a sax player I have long since been a fan of Kenny Garrett, albums like Songbook and Pursuance are must haves for any jazz fan, but does no one else get frustrated with the fact Garrett plays exactly the same show every time he's at Ronnie's? You just pretty much described the same gig I saw 4 or 5 years ago, and I know friends of mine have heard since, so that I find a little bit disappointing and chose not to go. If it was the reviewer's first time to see Garrett play then I can completely understand those comments. Garrett is a great saxophonist, and the opening roast of a tune is always a thrill, but for a jazz musician who clearly can give so much more to the world I wonder why he is constantly playing a "Greatest Hits" Tour?!" Anonymous, I'll be very pleased to publish your comment without the gratuitous f-word!